The AI-7160 is designed to be able to generate the high voltage ringing signal as required for many international compliance standards. This signal is typically 150 Vrms and is applied to the terminal equipment to ensure the equipment does not draw excessive current in the idle state or on-hook state. In addition the instrument can generate a DC bias to this ringing signal to further test compliance of the terminal to DC voltages up to +/-200 V. The AI-7160 contains all of the circuitry necessary to measure this current and the voltages applied and will calculate the DC resistance and AC impedance in real time. The ringing output signal may be left floating with respect to earth ground or ground referenced. Also the output terminals may be reversed in polarity, shorted or individually disconnected providing flexible test configurations. The DC feed resistance is software programmable with 32 different values ranging from a minimum value of 200 тДж to a maximum of 2250 тДж in series with the generator. Two external feed terminals can be used as an alternative to the internal resistance if required. The BNC connectors present on the rear panel provide a means of monitoring and injecting signals at various points controlled by the application software. The PC control software is included with the AI-7160. It provides an easy to use high level graphical interface for both configuring the instrument and viewing measurements. At all times the software is displaying the measured line voltage, loop current, and the resistance/impedance of any connected loads. The loop current meter can be switched to a low range for measuring both DC and AC(ringing) leakage currents. 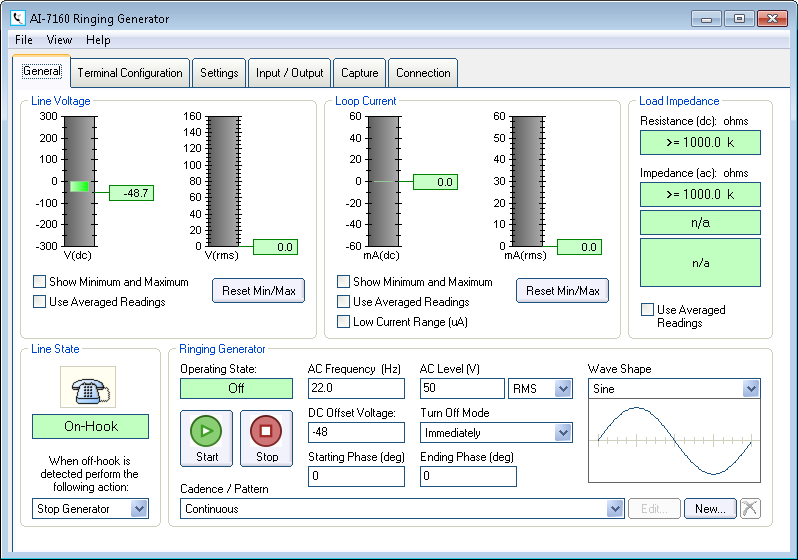 The control panel for the ringing generator offers complete control over all aspects of the waveform generated. In additional to level, frequency, and DC offset voltage, the starting and ending phase angles may be specified to simulate high inrush currents during start up and turn off conditions. Multiple wave shapes are available including sine, triangle, square, and varying degrees of trapezoidal wave shapes. The cadence (timing) of the ringing generator is programmed with a simple script. By default standard ringing cadences are provided by the software. However any number of additional scripts can be created. As well as controlling the ring timing the scripts can adjust other parameters such as level and frequency, all while the ringing generator is active. This provides a means for simple automation of some tests. A basic line voltage and loop current waveform capturing ability is also included in the software. Similar to an oscilloscope it displays waveforms representing the line voltage and loop current taken under various trigger conditions. This is especially useful for observing the ringing signal during transient conditions. Copyright й Advent Instruments Inc. All rights reserved.